Pictured (l-r) are Steven Sykes, Edison State professor of manufacturing and industrial management; Tony Human, dean of professional and technical programs; Ben Brigham, Nidec Minster talent development manager; and Chris Spradlin, Edison State provost. 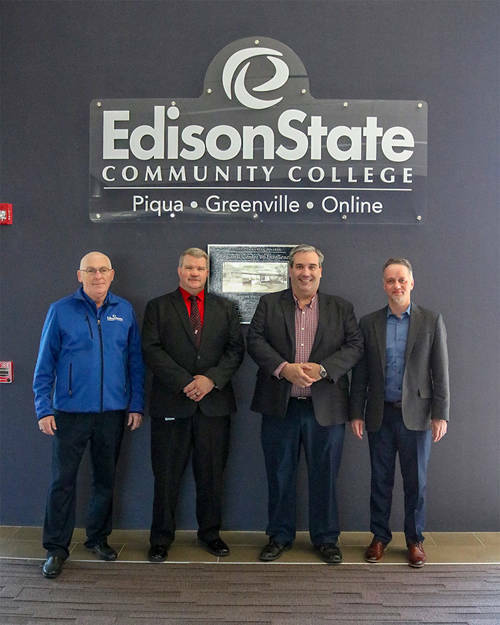 PIQUA – Edison State Community College and Nidec Press & Automation in Minster have partnered to develop a pathway to facilitate the awarding of academic credits by Edison State for technical training conducted by Nidec Minster. The new pathway will create a seamless transition to the next step in education for Nidec Minster employees to obtain an Associate of Technical Study degree with a major one of three pathways – mechanical design, electro-mechanical engineering technology or advanced manufacturing systems. The mechanical design, electro-mechanical engineering technology and advanced manufacturing systems ATS degrees help employees to qualify for advancement within the management ranks of Nidec Minster. The electro-mechanical engineering technology option prepares students for the design, interface, installation and troubleshooting of electro-mechanical systems as well as the skills to integrate electronics and electrical controls with mechanical systems in order to explore alternatives through the process of troubleshooting and problem solving. “Developing the three ATS pathways with Nidec Minster provides an avenue for adult learners to gain the necessary education needed to compete in today’s job market,” said Tony Human, dean of professional and technical programs. Edison State Community College is accredited by the Higher Learning Commission and the mechanical design, electro-mechanical engineering technology and advanced manufacturing systems ATS degrees are approved by the Higher Learning Commission and the Ohio Department of Higher Education. For more information about the degree pathways, call 937-778-8600 and ask to speak with a resource specialist.